RATCHABURI, THAILAND - APRIL 27, 2014 : Unidentified people on food boats at Damnoen Saduak floating market . Damnoen Saduak is a very popular tourist attraction near Bangkok in Thailand. hd00:33MATARA, SRI LANKA - NOVEMBER 10, 2014: Unidentified seller in street market sell fresh coconut . Many people buy fresh food on the street rather than at shops. 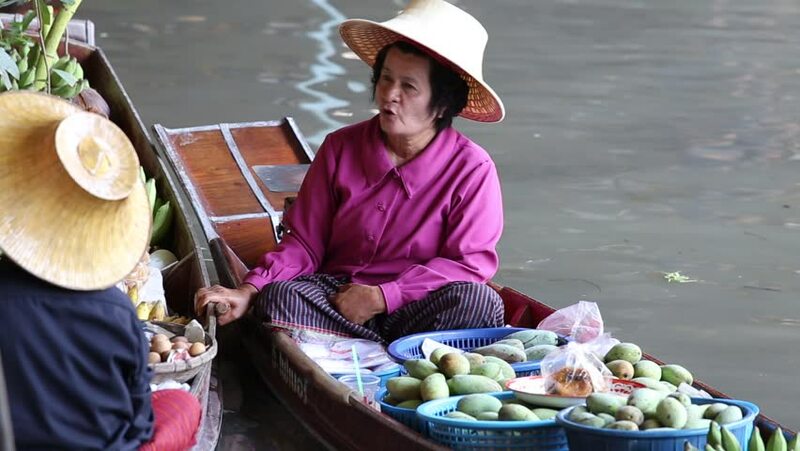 hd00:41RATCHABURI, THAILAND - APRIL 27, 2014 : Unidentified people on food boats at Damnoen Saduak floating market . Damnoen Saduak is a very popular tourist attraction in Thailand. hd00:09HAI DUONG, VIETNAM, January, 12: Buying and selling at the local street market. The market is flooded with all kinds of local foods.